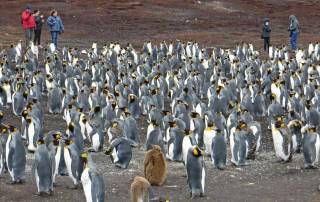 Volunteer Point Shore Excursion – Our Favorite! 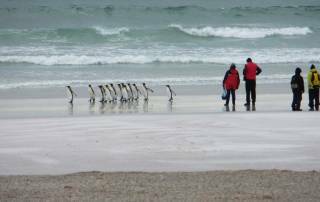 The Volunteer Point shore excursion is our favorite suggestion for the Falkland Islands. Locals call it Volunteers. Most cruise ship lines don’t offer this excursion, because of the risk of delays. 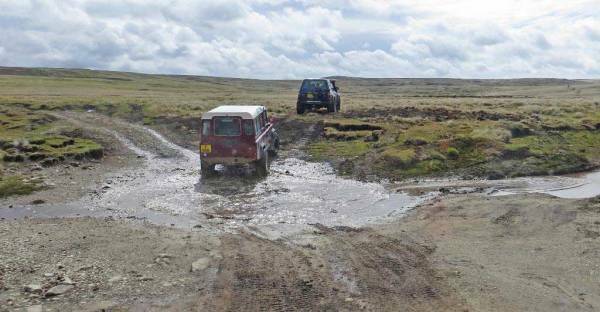 The peat bogs can easily trap an off road 4×4. 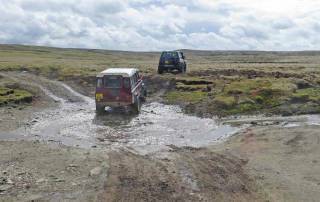 The locals have responded by organizing their own tour companies that use locally owned and driven 4x4s. They travel in caravans and tow each other out quickly if the circumstance arises. 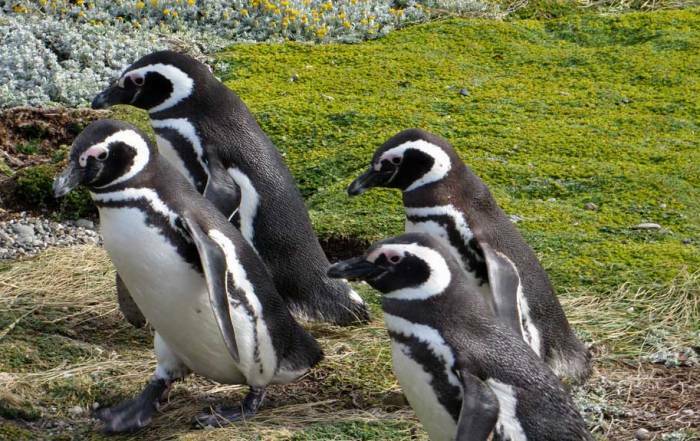 The 4 major tour companies to Volunteers are Estancia Excursions, Patrick, FITT and Penguin Travel. A private land owner controls access to Volunteer Point. 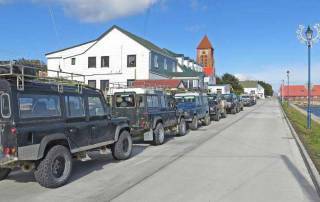 The owner restricts each tour company to a maximum of 16 vehicles. 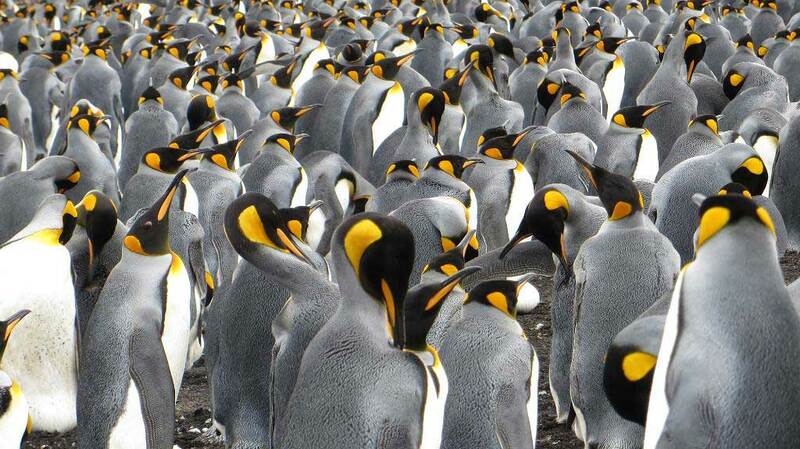 You are certain to see King Penguin at Volunteer Point, because the Kings live there year round. We travelled to Volunteers with Estancia. Nyree operates Estancia. Her parents own Estancia Farm. Payment is cash only in British pounds after the tour, but reservations must be made in advance by email. The tender from the Oceania Marina to Stanley was quite a long distance. Expect a bit of chaos upon arrival in town, as each company tries to get their 64 passengers into their 16 vehicles. Organizing took nearly an hour, because there were 3 cruise ships in port that day. Since only about 3,000 people live on the island, most of the population is involved in providing cruise ship shore excursions. We broke off into a sub group of 3 vehicles and headed out on our 6 hour excursion. It wasn’t until some time later that we realized our traveling companions were from an entirely different ship. About a mile from town the pavement ended. We travelled on a bleak, treeless desert of low scrub, abandoned mine fields and burned out helicopter frames. 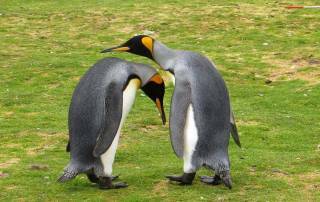 The Falklands has very poor quality grass which supports a few sheep, a few birds and an occasional fox. Most of the trip is covered on gravel roads, but the last 40 minutes is a continuous roller coaster of bumpy, boggy ruts. At speeds under 10 mph, it seems like this part of the journey will never end and that a back injury is imminent. The arrival at Volunteer Point makes it all worthwhile. There are three large penguin colonies within a few feet of each other. 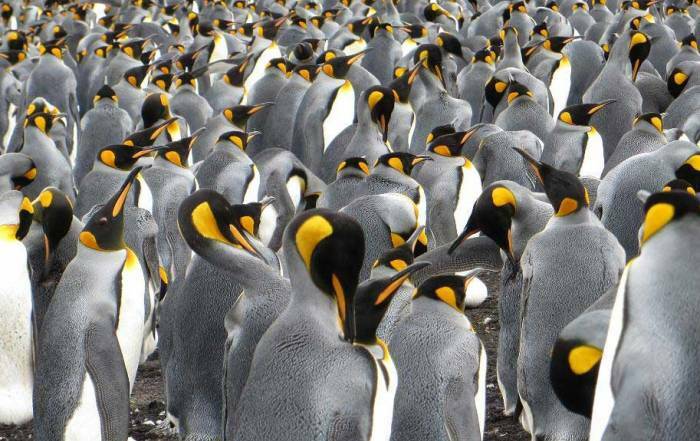 There are Gentoos, Magellanic and about 1,000 very majestic looking King Penguins. White marker rocks surround each of the main nesting areas. 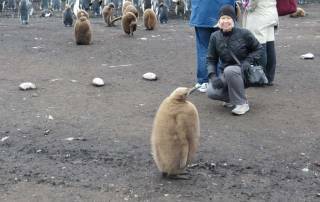 The penguins seem to know that tourists can’t cross the line. They will let you approach within arms length if you move slowly and deliberately. 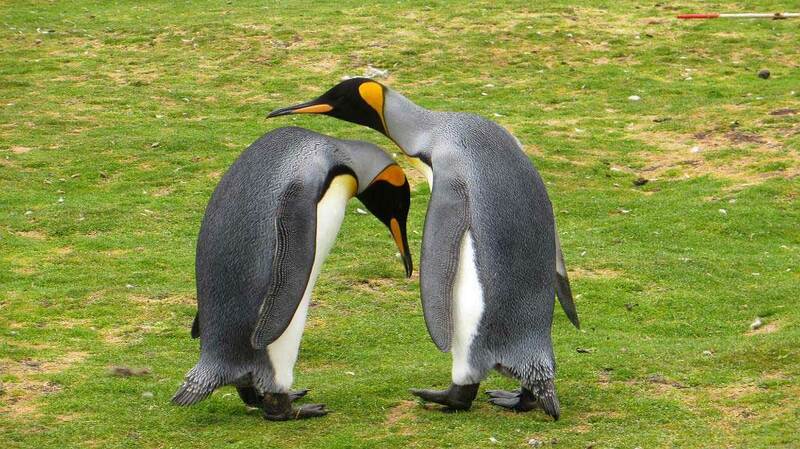 Our guide indicated that when they visit for extended periods, the penguins will get curious and approach people. They will peck at shoe strings or even allow children to pet them. 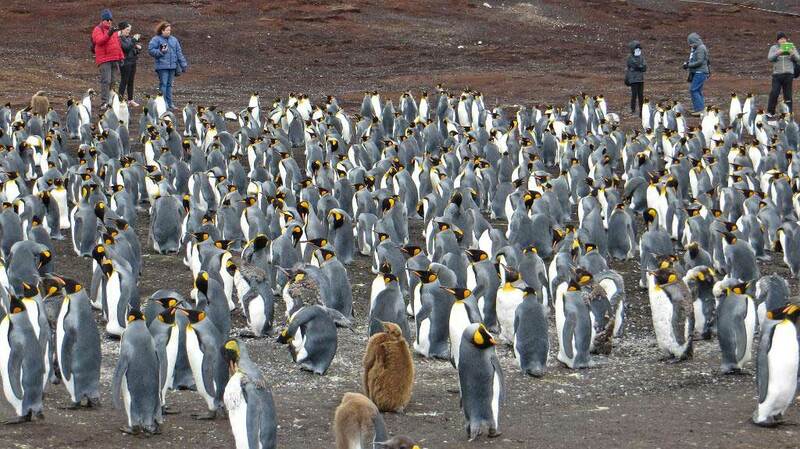 That December day the main circle of kings all had their backs to the chilly 48 degree F wind. The yearlings were like fluffy brown balls. 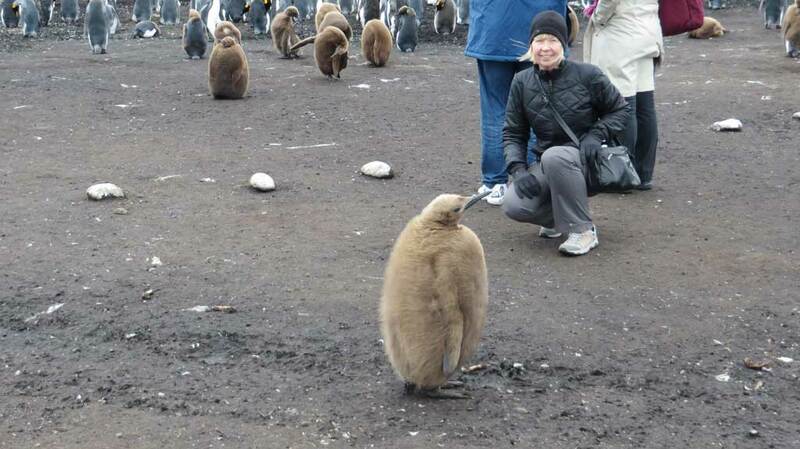 Many penguins were molting off their winter coats. 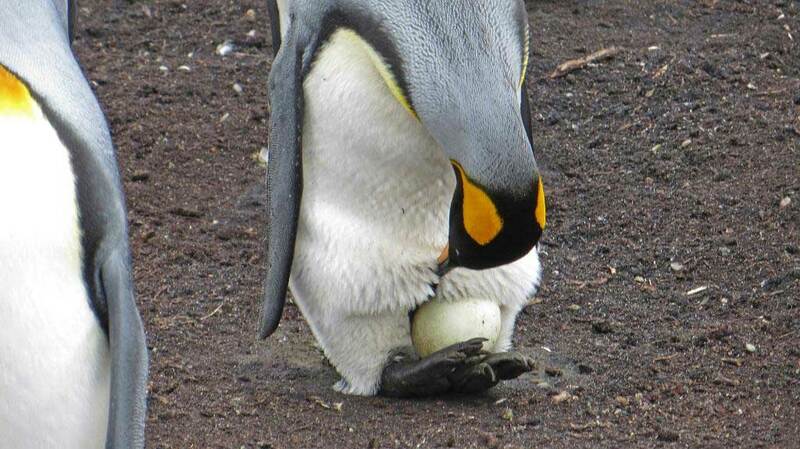 Some penguins would crane their necks to the sky and make a loud screechy cry. 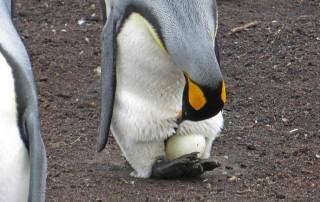 Occasionally we saw eggs nestled on top of their feet under their furry coats. Outside the circle markings, the penguins were much less confident and small groups would try to evade tourists who got too close. 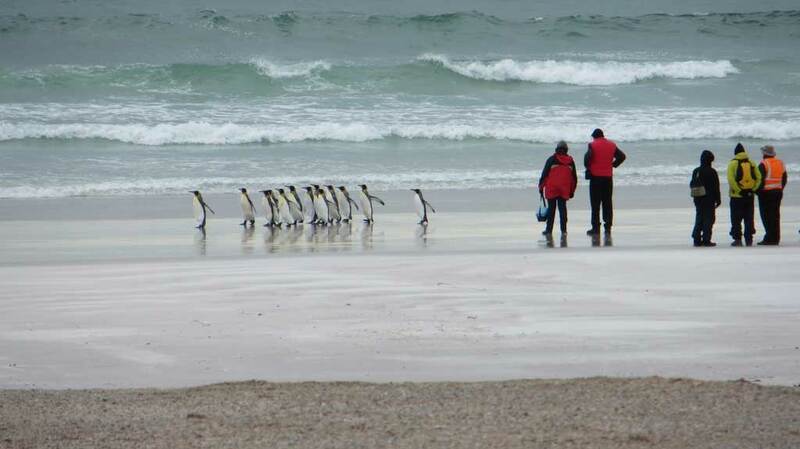 The site allows you to walk down to the beach with them to watch them disappear into the waves. Their agility in the sea is a stark contrast to their awkward stance on land. My favorite moments was getting up close and personal with a yearling who was not concerned in the least that I was within arms reach. After nearly two hours at the site, we were happy to retreat to the shelter of the vehicle and eat the bag lunch that was provided. The sandwich was half tuna & cucumber and the other half was cheese and pickled onion spread. Visitors seldom like the pickle concoction, but locals love it. The ride back was every bit as challenging as the way in, but it’s worth it. If you visit the Falklands, don’t miss the Kings. Next stop on the Oceania Marina itinerary, Martial Glacier Shore Excursion, Ushuaia, Argentina.